Gas heaters are essentially beefier versions of your home water heater, but are optimized for higher water volumes. These heaters are fired by either propane or natural gas. The selection of either is normally determined by their availability in your area. Most homeowners prefer the clean insulation of a natural gas line when compared to a large propane tank having to go on the side of your pool. Gas heaters use metal heat exchangers that are used to heat the water. 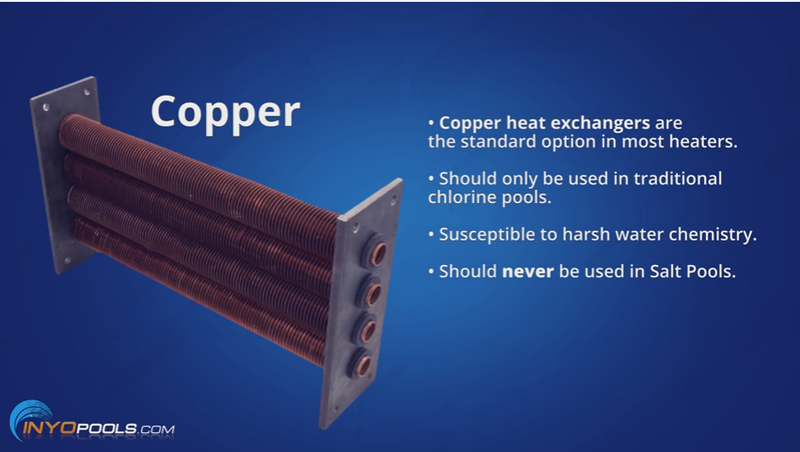 Heat exchangers are made out of copper or cupronickel. Copper heat exchangers are the standard option for heaters which should only be used in traditional chlorine pools due to copper fragility. These types of hea t exchangers are susceptible to harsh or imbalanced water chemistry and should never be used in salt pools. 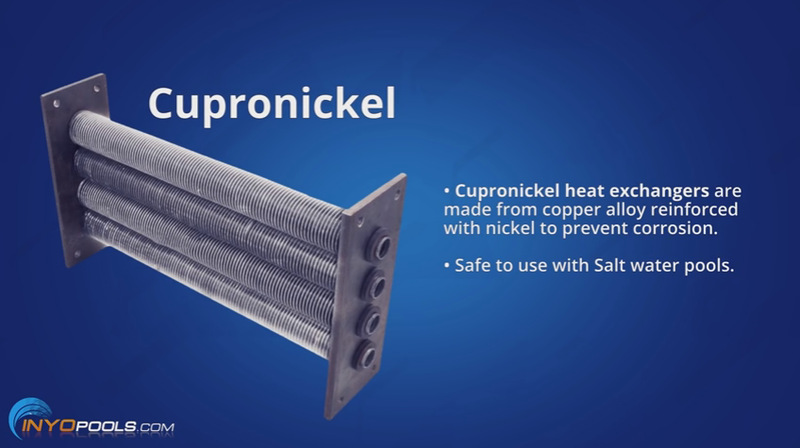 If you have a salt chlorine generator or want the option to install one in the future, your best bet is to go with the heavy duty cupronickel heat exchanger. These are made of copper alloy reinforced with nickel to prevent any ill effects from corrosion. Some heater models are sensitive to higher elevations. Raypak for example, requires heaters to have specifically sized orifices for installations over 2000 feet. Low emission heaters also known as Low Nox have gained popularity mainly due to local ordinances and state laws requiring of their installation on new pools or replacing old heaters. The Low Nox push has been huge in Southern California. Check with your local home or code inspector to make sure you get the right type of heater. If you do not live in a Low Nox required area, you can still install one to help lower your carbon footprint. Once you decided on the heater type, you’ll need to select the size. The sizes are rated by British Thermal Units or BTUs. Both residential heaters range from 100,000 to 400,000 BTUs. The correct heater size is determined by the time required to heat the pool. There’s the easy calculation used to select the appropriate BTU size. You take the desired temperature and subtract the average air temperature. This will give you the total heat rise. So, let’s say you want your pool to be 85°, and the average air temperature in your area is 70°. The difference is 15°. If you wanted to raise the temperature 15° in eight hours, you’ll need a heater that will heat the water roughly 1.8° in an hour. The next step will be to use the size charge provided by the manufacturer. 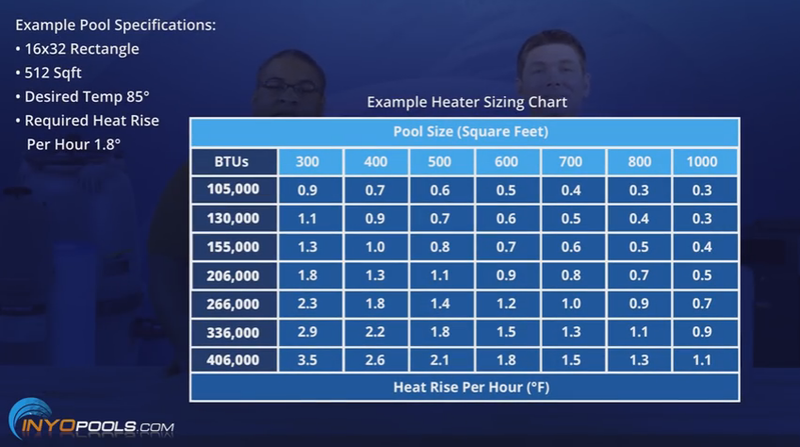 Using our example from the previous videos, we’ll select a heater for a 16 foot by 32 foot pool. Well, first you need to know the surface area. So, you multiply 16 foot by 32 foot which gives you 512 square feet. As you can see from the chart, the BTU sizes are listed along the left side and the surface areas are listed at the top. The column under 500 square feet lists the degree rise per hour. We know that for our example, we need a model that would heat the pool at a rate of 1.8° an hour. In this case, the 336,000 BTU heater will be sufficient. Well, I have to say heat pumps are pretty interesting machines. Heat Pumps do not create their own heat, but instead pull heat from the ambient air. Heat pumps use a super heavy duty titanium heat exchanger to make it virtually impervious to even the harshest of water chemistry. The downside of heat pumps is their sensitivity to cooler temperatures. The cooler the weather, the less efficient they become. Most heat pumps won’t work efficiently in whether temps lower than 50°. True, but there are some models like the AquaCal Ice Breaker that can operate in temperatures all the way down to the low 20’s. But unless you plan on coupling a heat pump with a gas heater to supplement for inefficiencies, heat pumps are best for pools in southern or warmer areas like Arizona, Florida, Texas or Nevada. Another important note on heat pumps, they should only be installed outside as they require a constant supply of fresh air to work properly. Heat pump sizing is not as straight forward as a gas heater. There are several variables they have to take into consideration like: where the heat pump will be installed, will it receive direct sunlight or be in the shade, how much sun does the pool receive and do you live in a windy area? Many other variables to consider too. For this reason, we recommend contacting our technical support as they have the know how to properly size your heat pump for your application. 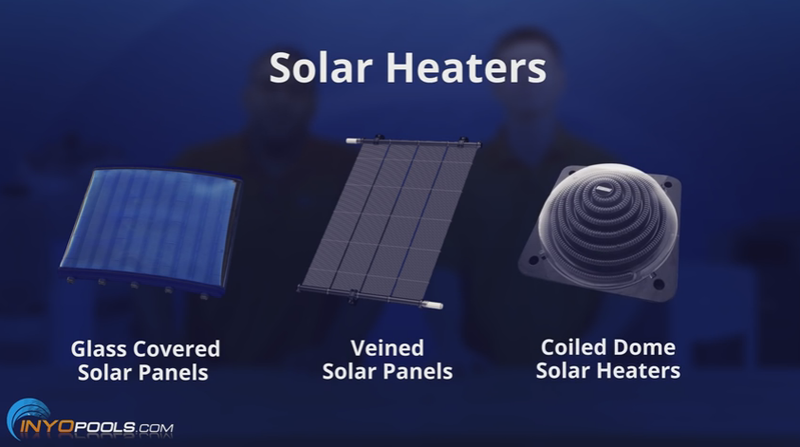 And finally, that brings us to solar heaters which take a few different forms: like your standard glass covered glazed panels, veined rubber-like mat panels, or coiled domes. With any of these choices, the process of heating is basically the same. The panel is set in a sunny area, likely a roof so it can absorb those toasty solar rays. Water is then run through the panel and as it does so the water takes the stored heat and brings it back to your pool aka free heat. For anyone cheap like me and like you, free is the favorite word. The size of your solar panel array is tied to your pool’s water surface area. The array heating your pool should be equal to or greater than 50% of your pool surface area. For example, if you have a 16 by 32 pool, the surface area is 512 square feet. So, you’ll need a panel array that’s at least 256 square feet to adequately heat your pool. Solar systems are offered in packages according to pool size or single add-on sections, so you can make your solar panel array as big as your pump can handle. Now as we’ve mentioned in other parts of this selection series, it is acceptable to oversize a heater to make sure your pool reaches the desired temperature in a reasonable time. For a super in-depth look into solar heaters and how they work, read our blog written by the one and only Matthew Simmons. Well, that just about covers heaters. If you have any other questions about heaters or anything else, give us a call at 877-372-6038. If you’re enjoying this series and find this information helpful, please subscribe to our channel and stay tuned for the next part of the series covering sanitizers. You have a typo in your sq ft calculation. You listed 60 x 32 pool size = 512 square ft, I believe you meant 16 x 32. Otherwise nice starter article for the novice. Hi guys thank you for your tips. My pool is round above ground , 54″ x 27′, how to calculate the time to heat the water at 15 d, if i want to go fom 70d to 85d with a 250.000 btu heater. Use the 266 line on the chart to aproximate heat rise. 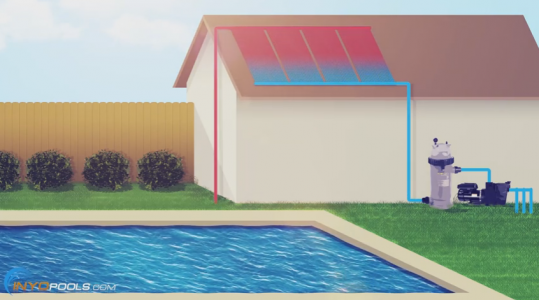 My house uses a so-called geothermal heat-pump – when it’s cooling the house it dumps the heat into a pipe buried underground, BUT if the pool is less than 90º, it dumps the heat into the pool instead of the ground. When the pool is less than 82º, the gas boiler kicks in, so there are two heat exchangers in tandem. This arrangement works exceptionally well. I’m sure it does, unfortunately, that is not a viable option for most homeowners. Matthew: Do the Cupro Nickel heat exchangers really work with Salt Pools? My installer put in a standard copper exchanger and it only lasted four years. I recently installed a MasterTemp with the cupro nickel core, but I’m seeing a lot of deposits in the pool after just four months. The deposits are dark on one side and light blue/green on the other. I’m afraid it’s breaking down again. George: I have a geothermal system too. It heats/cools both the building and pool. Works well most of the year, but has trouble keeping up in the middle of Colorado winters. Natural gas is still very cheap, so I only heat the building with geo from December through March. I haven’t come close to calculating the cost of heat for geo vs. gas. Can’t determine how much electric the geo is using as its efficiency is a function of ground water temperature and building load. 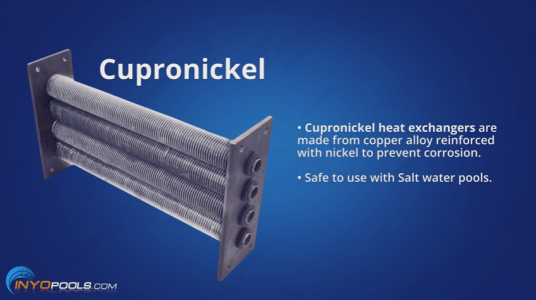 Cupro-Nickel heat exchangers main purpose is to hold up under corrosive water applications like salt. I am surprised a copper heat exchanger lasted 4 years. Have you tested the water and/or the stains to figure out their chemical makeup? The stains may be from the heat exchanger or some other component. Test the stains and your water then post the results. No stains, thankfully, just granular deposits near the warm water outlets. 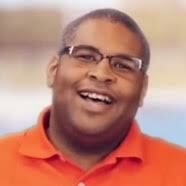 I had the water tested at my local pool supply store and they said it’s high in copper. Used a metal remover that temporarily lowered the copper levels, but now they are back up to 1.4ppm. I suppose this could be remnants from the old copper exchanger, but I’m afraid it’s the new Cupro-Nickel one breaking down. Isn’t the Cupro-Nickel just a coating over a copper exchanger? Don’t really think my water is too corrosive. Plaster pool with pH of 7.3-7.4, salt at 3150, alkalinity at 120 and hardness at 250. Because it’s indoors and has a relatively low swimmer load, I keep the salt-generated chlorine at 1.0-1.5ppm with no stabilizer. I’ll pick up one of the stain testers anyway. Have some old stains from the initial pool installation. Thanks for the fast response and a great column, Matthew. Cupro-nickel is an alloy the whole exchanger is comprised of, it is not a spray or coating. Give us updates on how it plays out. OK. Can’t do much until the new exchanger fails. I’ll use metal removers to lower the copper levels for now. I’m hoping I’m just seeing remnants of the old exchanger clearing out of my system. Appreciate your help, Matthew.